The past weeks have been crazy busy at my house. Not only were we in the midst of Halloween, but we also had out of town guests staying with us. 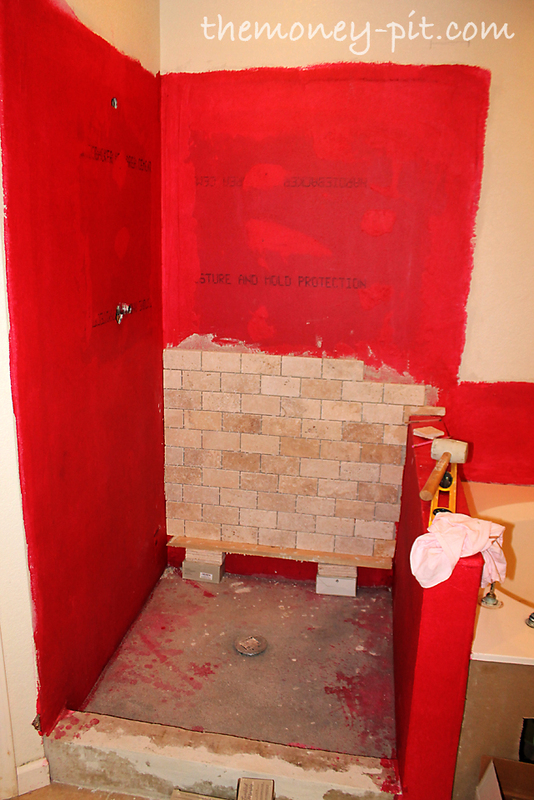 Needless to say, not a lot of progress was made on the bathroom remodel. The exciting part is that I did start tiling the walls! 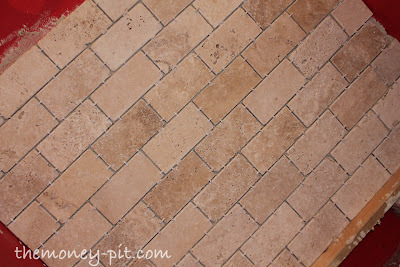 Like I showed in my inspiration post, I went with a 3x6 tumbled travertine marble. I decided to set them in a subway pattern. 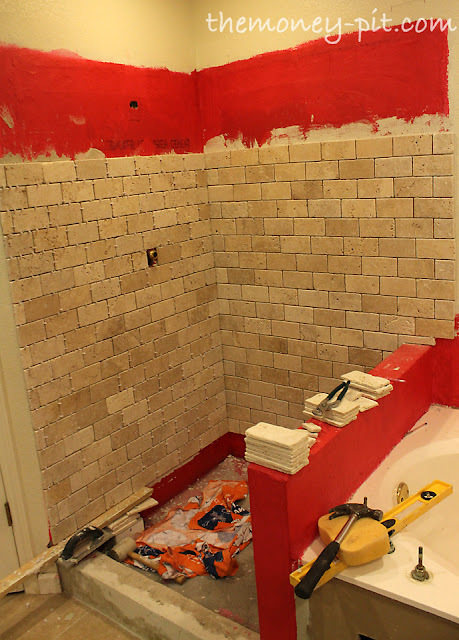 The way I tackled the tiling was that I left a space large enough for 2 rows of tile along the bottom of the shower wall. You don't want to start right at the floor since the floor isn't level. Instead I will cut the angle of the floor into the bottom row of tiles where it will be less noticeable. 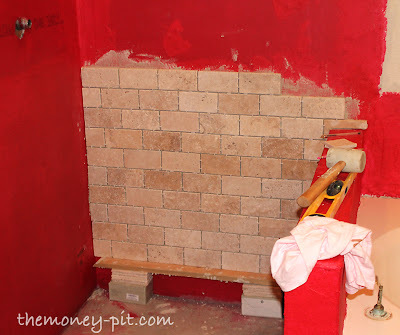 By starting 2 rows up, I was able to make sure the rows were level (I used a few boxes of tile and a board to set my first row of tile, making sure it was level.) DON'T ATTACH THE BOARD DIRECTLY TO THE WALL OR YOU WILL PUT HOLES IN YOUR WATERPROOFING!! And by the end of week 1 this is as far as I had gotten. Some specifics about this tile. It is chiaro tumbled Turkish Travertine marble. I ended up getting it at Lowe's because even though it was about 60 cents per square foot more than the tile shop (I paid $4.26/sqft), but I will be able to return any that is unused. I also didn't have to pay any shipping or handling and could buy it by the individual square foot. I knew that would be important because the individual tiles are very VERY different. I wanted to make sure I could pick out the best tiles without huge imperfections, holes and cracks. I originally purchased almost 33% more tile then I needed, knowing I would return a lot of it. I used 1/8th inch spacers since the variation in tile size was quite large. I originally wanted to use 1/16 spacers (the smallest you can reasonably use) but I knew with the rough edges of the tile it wouldn't work out. 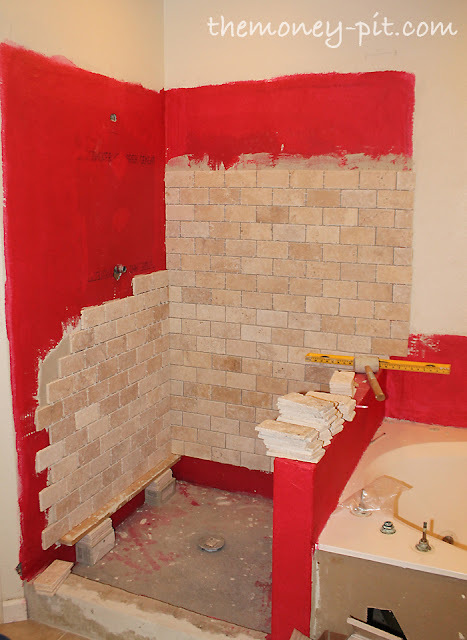 To set the tile I used the same mortar I used to patch the walls, which is specifically designed for travertine. UPDATED 12/16: I was able to return $119.56 worth of tile after completing the shower and tub. This credit is reflected in the budget in this post. It's looking very good! It would probably take us three times as long to complete that work. I think it is looking fabulous. I've been following the remodel so far and love it. At least you can see some progress as you work, even though it is slow. It will be so worth it in the end I'm sure, so keep up the great work! Your tile job looks fantastic! I love the look of tumbled travertine tile. Until you explained it, I had no idea they were so varied in size like that. I can see how purchasing them at Lowe's at a slightly higher cost is ultimately worth it since you can return the unused tiles afterwards. Great job! Love the tile you chose! It looks fabulous! Just wanted to encourage you to keep going on the tile... it looks amazing and you picked great tile. I think in the end, you'll look back and all the hard work on this one will be well worth it!